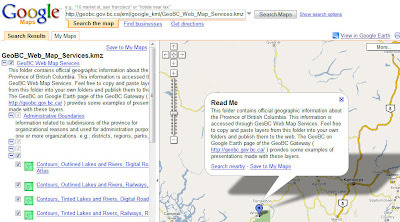 For some time we've know that the Province of BC and Google have been striking backroom deals on sharing data... Last week, Agriculture and Lands Minister Stan Hagen announced GeoBC, (http://www.geobc.gov.bc.ca/) will provide 24/7 access to the province's geographic database in partnership with Google. This information will be available online at geobc.gov.bc.ca and from Google Earth. Apparently, this move makes B.C. the first government in Canada to supply Google with access to its information. Interesting to see that the Provicne has noted on the GeoBC/Google gateway page that data layers for use within ArcExplorer are coming soon. For data see - GeoBC Web Map Services (KMZ) This package contains a variety of layers such as Agricultural Land Reserves, Contours, Lakes, Rivers, Roads, Railways, Imagery, Lot Lines, Map Grids, and Parks and Protected Areas. Selected BC Park Profiles (KMZ), This package contains links for selected BC Parks to the web page containing information about that park. Note, you can also copy/paste these links into Google Maps for preview.